1.12.2 New Update (version 4.0.0.0)!!! The new version (1.12.2-4.0.0.0) and all what comes after it will not be compatible with older versions. I have recoded the entire mod with better and newer code. This because of many reasons. You won't regret it, i promise that! Enjoy building with beautifull blocks!! It seems i have to update biomesoplenty. I still use version 2194. Yeah i saw they have been removed from the game. 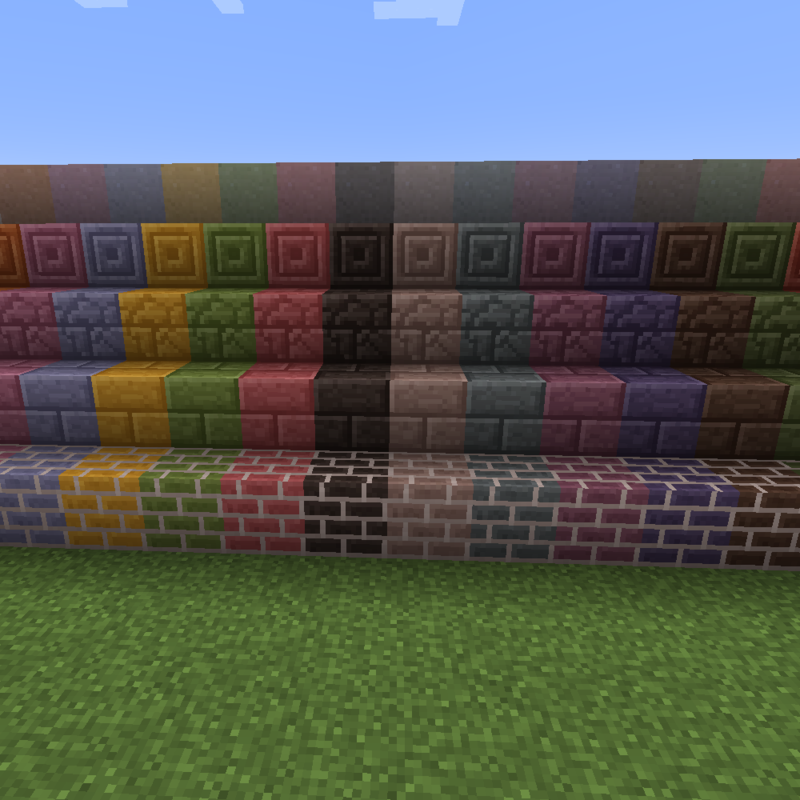 The crash you had with my mod is because i added support for thise stone types (i added walls, slabs, stairs). I removed The support for those blocks. The crash should be fixed now. I also fixed the walls. The new version has been uploaded but hasn't been approved yet. Won't take long normally. Download will be availeble soon. Hmm, these crafting table variations are in the Random Things mod (with Biomes O Plenty woods too) and theese chest variations are in the Quark mod. But truly in Quark mod not Biomes O Plenty variations ith the chests. Are these chests could make from Biomes O Plenty woods too and then they are look like from these woods? And this mod i hope won't conflict with the Random Things and Quark mod, i use these too. The picture above is from the 1.11.2 mod and also almost 1 year ago. It has also a config where you can disable all these stuff. For example if you don't wnat to use my crafting tables but instead from another mod, you just disable them in the config. I'm also not sure if i'm going to add them in 1.12.2. I'll think about it. I see. Since i downloaded this mod and i tested it. And yes, i found the config and i did set the things. But the Minecraft with that mod sometimes really lagged to me. I use some other mods too, not only Quark and Random Things, maybe that's why too. But some of my used mods not really use big RAM, maybe just 1-2 and i think this mod use a bit bigger RAM too. And ok, the 1.12.2 update doesn't really care me, because i like the most the 1.11.2 version, i won't update it. But of course to other players, who play with 1.12.2 version, they will be glad. So i am sorry, but i deleted that mod, i like few parts from it, but i told you the situation, so in that case i won't use it. I am sorry, maybe you understand it. My mod doesn't use lots of ram. There are no complicated blocks. Just more variation. Your ram issue must be from something else. Ofcourse you are free to do whatever you want. There is absolutely no point in telling me here you don't gonne use my mod. If you don't wanne use it, then don't. Why even bother to tell me? Ok, i thought it's use more RAM, it's looked like that. And before i left 1 GB RAM for Minecraft, the Xmx was 1 GB, the Xmn was 128 MB. Since i found infos i can set it to better, higher. So i did set the Xmx to 2 GB, the Xmn stayed 128 MB and i added Xms, which is 1 GB. I tested with this variation 2-3 times, it's looks like better than before and the Forge loaded somehow a bit different too. The Minecraft run a bit better. Maybe with that mod it will be better, i will try/test with it. Do you think am i did set the RAM well for it? I am not a big master in that, sorry. So i don't know yet, am i will use this mod, or not, depend on the test too. And i think it could be interesting, if the sticks could be different wood types too, like birch stick, jungle stick and the other ones. And then of course from these sticks could be crafted the different type of ladders, which ones are exist already. But then you should modify their recipe for that, we could craft for example with birch sticks the birch ladders. And i think it could be better, if we could set in the config seperate the standard Vanilla wood type things tor turn on/off, seperate the Biomes O Plenty things turn on/off too. Of course at chests, trapdoors and at ladders too. Could you make update with these things? It could be good and interesting. For example if i use this mod, i would like to turn on the Biomes O Plenty trapdoors only without the standard Vanilla ones. I use Quark mod's ones, like the chests too, i would like to use the Biomes O Plenty chests too, but without the birch, jungle etc. chests, they could be turn off in the config. But the iron, gold, diamond chest are interesting, i like them, could be emerald chest too. As i said, i use the 1.11.2 version, so i mean to update these mainly for that version. If you will do it, then thank you. And the feliron ore, feliron are existing, real things, like diamond, gold, ruby and other things like that, or did you imagine it from your own? The amount of ram you can/should use depends on your system. But you should never allocate more then half of your max ram. For example if your system has 8 Gb then don't go over 4Gb. For an average modded minecraft game with multiple mods i recommend 4Gb allocated. 1 Gb just isn't enough and even 2 Gb isn't. I'm sorry to tell you that i won't update 1.11.2 anymore. 1.13 will be out very very soon and 1.11.2 is old. If you don't want to update because your favorites mods haven't, that's fine. I recommend to keep an eye on popular mods (such as biomesoplenty for example) That do upgrade very fast and stick with them. You can request features or whatever stuff you wish and they might consider added it. Biomes o plenty and Quark update very fast. You might find the features from not updated mods in other updated mods. Feliron ore is an ore from World of Warcraft. Google if you like to know more. I allocated Xmx 2 GB and Xms 1 GB as i said. Then i think it's 2-3 GB. Maybe one of them better if i add plus 1 GB. But if it's count 3 GB, then not. Hmm, that's a bit sad you won't update it as i asked. And will you add at least the different sticks, what i said too? No problem the stick line, just use the original stick texture from the Vanilla textures, copy and recolor them, that's all. And yes, i know the Biomes O Plenty and Quark updated fast. Mainly the Biomes O Plenty. Since i did set the Xmx 3 GB and the Xms 2 GB. I tested with that variation too, looks like well. And will you add at least the different sticks, what i said too? No problem the stick line, just use the original stick texture from the Vanilla textures, copy and recolor them, that's all. Any chance to get quartz walls / nether things and a backport to 1.10.2? quartz walls is something i might add later. What kind of nether things you want me to add? Sad, i'd wish more modders used compatlib. Unfortunatley all big mods are on 1.10.2 and so am i. So nevermind and thanks for your work.